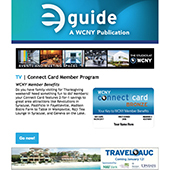 Create relationships with WCNY members, who enjoy dining, attractions and exploring the region! Introduce your establishment to a highly educated, affluent audience. Reach 14,000 WCNY members, their friends, and families. Reach a potential audience of 1.8 million viewers across Central New York, the Finger Lakes, and the Mohawk Valley. Production of ads and digital INCLUDED! To reach an audience who wants to explore the region, while saving money. We’ll create high quality multi-platform (TV, radio, digital, print) assets to promote your business. Your spots featured across 5 WCNY TV channels. Watch here. Highlighted on three WCNY radio stations. Listen here. Listing on wcny.org with a business description, photo and link. Featured in Connect Magazine to 13,000 members. 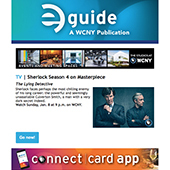 Listed in Connect Card directory provided to WCNY members. Featured in e-guide to 17,000 subscribers. Photos, menu, and information listing on the Connect Card App. Available on iOS and Android devices. Promoted to 10,000 social media fans.